PIMCO closed-end funds have a significant following owing to the team's solid markets expertise and management savvy. We review tools that allow investors to track these funds closely. Our Chartbook and Dashboard tools allow investors to steer clear of funds in danger of distribution cuts, swap cheap funds for expensive ones and evaluate relative performance and valuations. 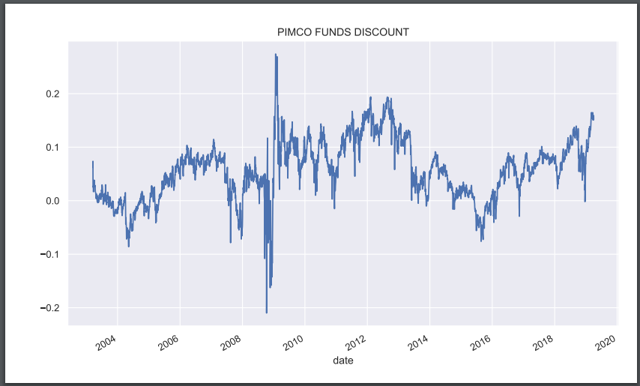 PIMCO funds enjoy a wide following among the income investor base for a good reason. These funds are usually among the "best-in-class" owing to the firm's deep bench of analysts and experience. This does not mean, however, that investors should just buy any of these funds or all of them at the same time. As the recent distribution cuts among the PIMCO set showed, various PIMCO funds can have very different outcomes and holding the wrong fund can lead to permanent capital loss. Falling into such traps, in our view, often happens because investors lack a systematic investment process. Most investors, however, do not have the time to develop one - this is where we come in. In this blog post we briefly review the two tools we have put together that we think is of value to most investors who follow the PIMCO suite. The Chartbook holds a collection of different types of charts - each type is briefly described below along with a screenshot. A set of charts showing aggregate metric of the fund group - here we show the average discount of the fund group. 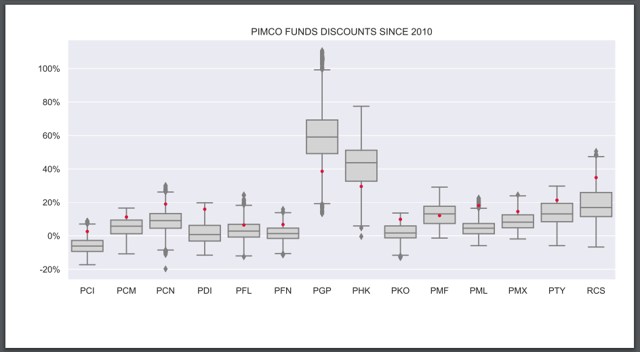 This chart is useful in evaluating how the fund group looks in aggregate - for instance, we can see that based on the aggregate discount, the PIMCO funds looks quite expensive currently relative to its history. Of course, that elides a lot of variation but it's a quick way to capture what is going on in aggregate. Monthly peformance (previous and current month) of individual funds. 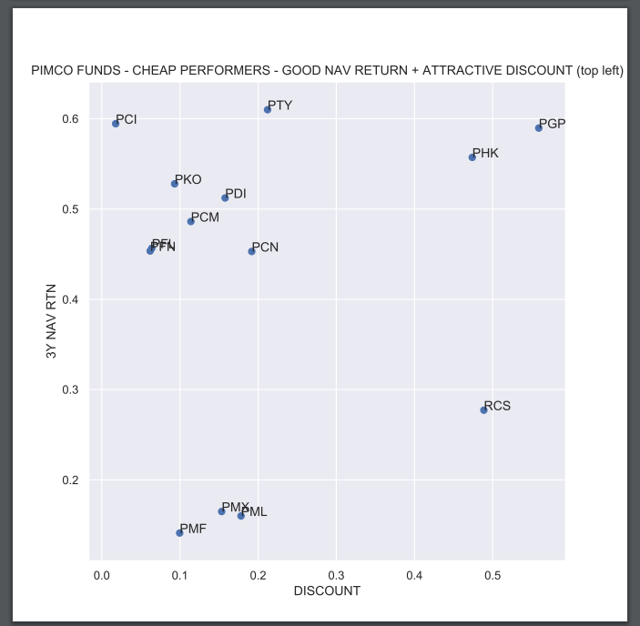 These charts show various metrics (price, discount, yield) for each fund historically. 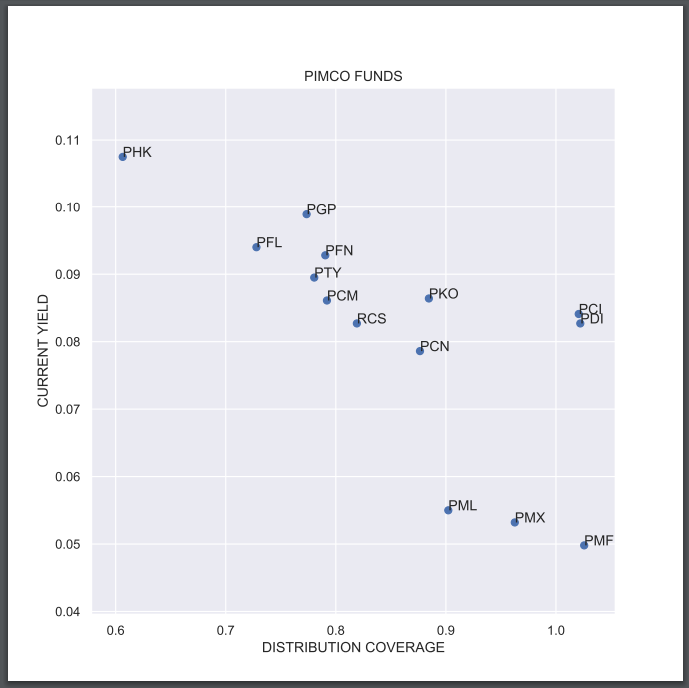 It's a nice way to see 1) how the funds compare to each other currently (compare red dots), 2) how the fund trading ranges compare to each other (PGP has had a wild ride in discount compared to the other funds), 3) how the fund's current valuation looks in historic terms i.e. 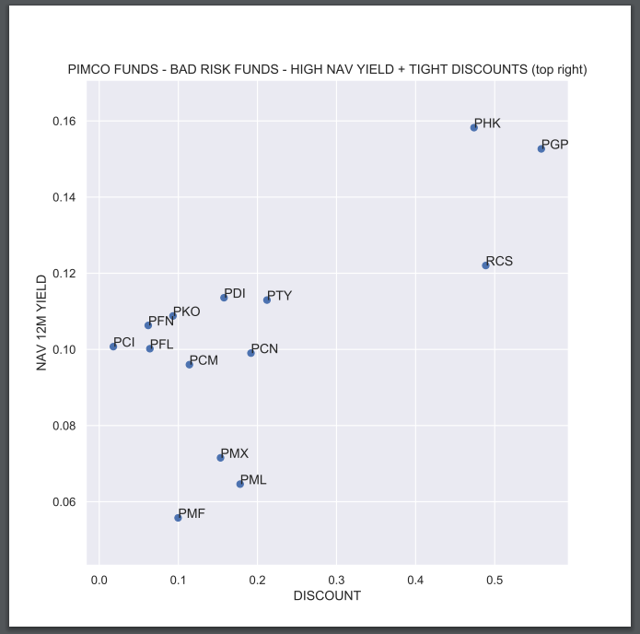 PKO looks quite expensive whereas PMF less so. We find scatter plots to be very useful because they capture two metrics at the same time - each chart has a different theme. The yield vs. distribution coverage chart is essential - for example, it's well worth knowing that PCI gives you the same yield as RCS but at a much better coverage level. "Cheap Performers" (top left) shows funds that you can pick up at, essentially, a cheaper price and a higher margin of safety at a given NAV return e.g. PCI has had a better NAV return than PHK and yet PHK has a much higher premium. 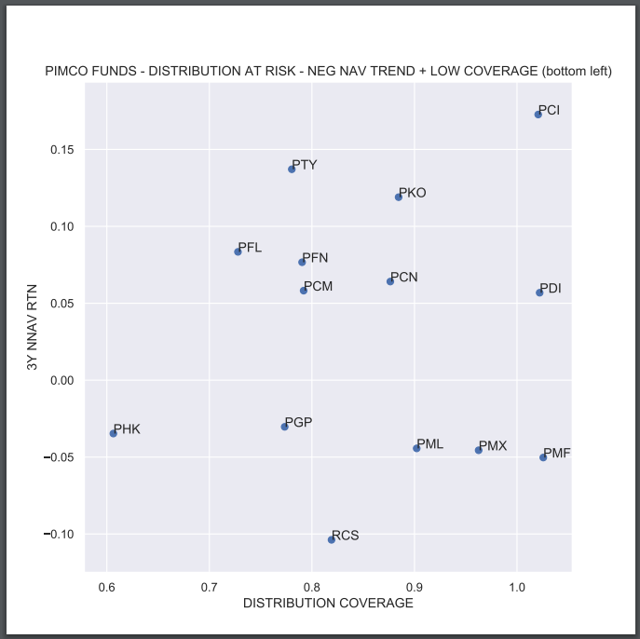 "Bad Risk Funds" (top right) are those funds that have high NAV yield because they are taking excessive risk or because they are overdistributing. Such funds are often rewarded with high premia for no good reason. 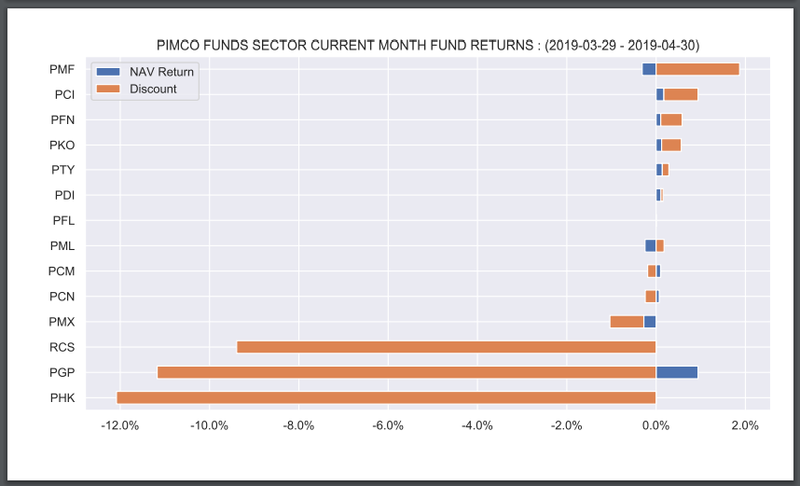 And when these funds inevitably cut their distributions, their premia unwind dramatically leading to significant losses. 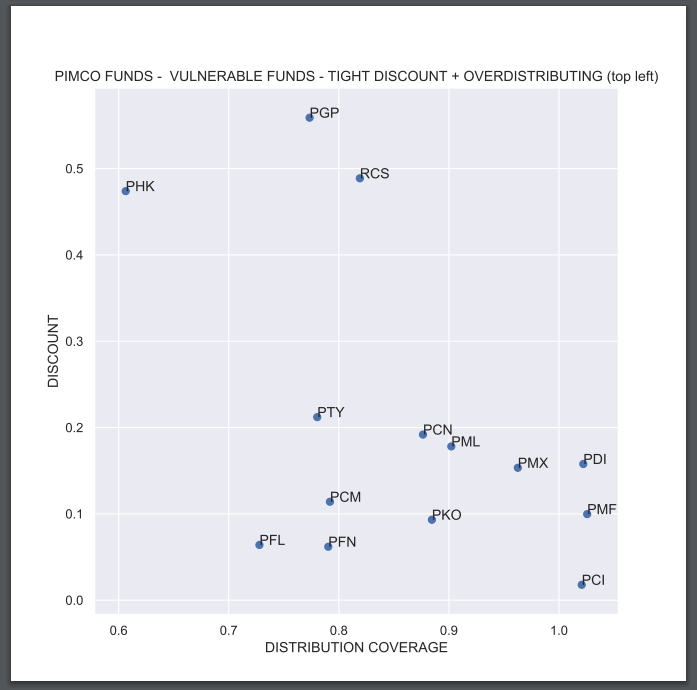 "Vulnerable Funds" (top left) are funds that do not cover their distribution and are trading at a premium. "Distribution At Risk" (bottom left) funds exhibit negative net NAV returns (ex-distributions) while not covering their distributions. 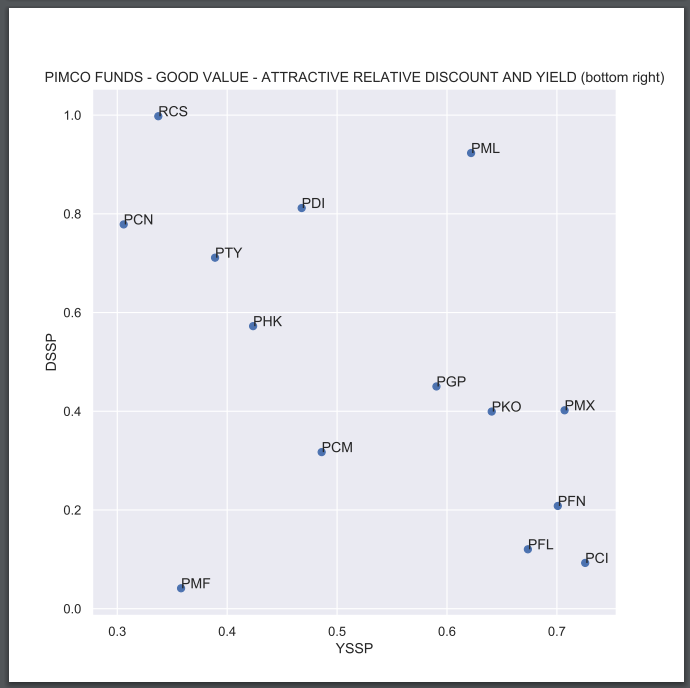 "Good Value" (bottom right) funds are those having an attractive relative discount sector spread as well as yield sector spread. The other piece is the Dashboard which is a table showing all key pieces of information. The table is sorted by "Score" which is a rank order of various metrics we deem important, so the most attractive funds are at the top. The Dashboard is useful for investors not only as reference material but also as a way to visualize what we consider the top funds in the group. Both tools are updated on a weekly basis on our Marketplace service. If you would like a free sample please reach out or sign up for a free trial below. Check out Systematic Income and get immediate access to our unique suite of analytics of the entire income CEF space. Get immediate access to wide-ranging analytics for hundreds of funds. Explore the best funds and sectors as well as our yield-target portfolios and systematic investment strategies. For our recent launch we are currently offering legacy pricing for the month of April - 30% off the annual rate. Check us out on a no-risk basis - sign up for a free trial! Disclosure: I am/we are long PCI.